What the first thing that comes to your mind when you’re thinking of buying a house? Is it the bathroom? The kitchen? The bedroom? Do you even consider the hallway? Well, a lot of people don’t seem to care about the hallway, and in doing so; they are forgetting an important part of the house. The thing is, the hallway is the first thing that people see when they enter your house. If you neglect that part, you’ll probably be giving a bad first impression, and like it or not, first impressions are essential. You should make sure that your hallway properly reflects the overall style of the house. Today, we will be shedding light on an important, yet often overlooked a piece of furniture. We are going to be talking about the best entryway storage benches. Why Consider Getting a Storage Bench? Want to Build a DIY Entryway Storage Bench? Entryway benches are pretty good in making your guests feel welcome. Storage benches, on the other hand, come with the extra benefit of being able to hide away things that might detract from the look of the entrance. Let’s say you have a no shoe policy in your house, well you can store them inside a storage bench without having to worry about cluttering the house. You’d be surprised at how big of a difference a storage bench can make. You’ll be instilling a much better impression on your guests while also saving space. With that said, picking the best storage bench for your house can be tricky, especially when there are so many choices available. One of the first and most important things to take into account when buying a storage bench is whether or not it fits with the general style of the house. If you’re going for a minimalistic look, don’t buy a bench with a lot of intricate detail. Remember, the hallway is the first thing that people will see when they enter your house, and it should give them an accurate idea about how the house would look like. Another thing to take into account is how much space you can spare for the bench. You can find an amazing bench that adequately reflects your style, but you won’t have any use for it if you can find a place in which to put it. Aside from the general look of the bench, you’ll also need to think about its storage capacity. Try and find one that should accommodate the size of your family. If you have kids, you’re going to need a bigger storage bench than people who don’t. It’s essential that you take this into account in order to make use of the storage feature and also embellish your house at the same time. If all of that seems to you like a lot of research, don’t worry. We’ve compiled a list of the best storage benches available. We’ve tried to include different types for different uses. So, without further ado, here is the list. Simple, Elegant, and can fit in many interiors, the Simpli Home Wood Entryway Storage Bench is great to look at and efficient as its storage will allow you to store boots, shoes, and any other winter clothing with no issue. It has a flip-up lid that facilitates storage and retrieval. It’s a great way to eliminate unnecessary clutter from the house and look good while doing so. 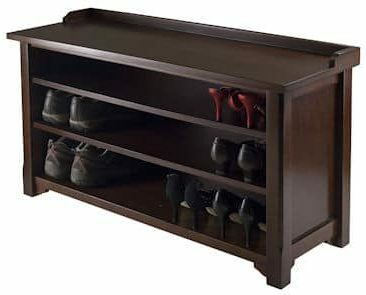 The Simpli Home Entryway Storage Bench has a dark brown wood finish that is sealed with premium-quality NC Lacquer coating. This makes it rather versatile in that it can look good in many different households. It’s also handcrafted, and you can tell that a lot of care has been put into making it look as stylish as possible. It has a raised panel in the front which is very distinctive. There is also an X pattern on the back which makes it stand out. Additionally, it comes with a couple of handy safety features. For instance, there is a safety hinge on the lid to prevent your child from getting their fingers hurt. You children will be thankful for this. 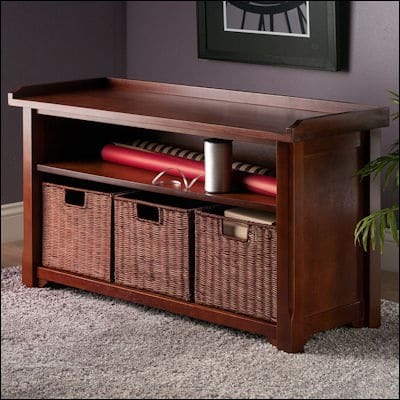 The Simpli Home Amherst Solid Wood Entryway Storage Bench also has enough room for two people which is rather useful. The Simpli Home Entryway Storage Bench is a solid product that’s safe to use, easy to set up, and beautiful to look at. What else could you ask for in a hallway storage solution? Both functional and stylish, this entryway storage bench is a great choice that shows to your guests that you have a taste in decoration! You’ll be surprised at how much it embellishes your hallway once you place it there. Not only that, but it can efficiently hold all of your shoes with its three wired baskets. Another great thing about the Winsome Wood Milan wood storage bench is that it comes ready to be assembled, that’s when you are going to let your DIY skills shine. 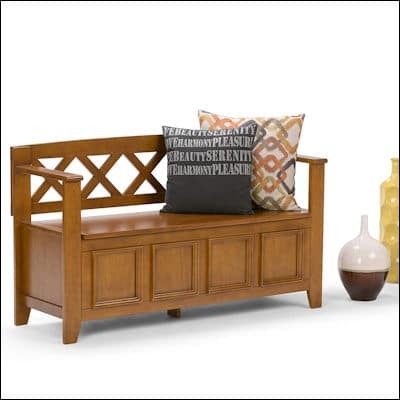 The Winsome Wood Milan wood storage bench has a solid wood finish in antique walnut stain. This makes it look good in many other different houses no matter the décor. The built-in storage bench is handy for storing lunch bags and boxes as well as shoes and slippers. You’ll also appreciate the 40-inch-wide bench that is rather comfortable to sit on. Winsome Wood Milan wood Storage Bench is a storage solution that will surely give you the bang for your buck as it’s comfortable, offers plenty of space, and boasts a solid construction. The copious amount of choices you have access to in terms of benches for your entryway can make the process of choosing the perfect bench for you seem like a daunting task. However, the Linon Home Décor Cynthia Storage Bench is rather unique as it’s an elegant bench that is as functional as it is stylish. The walnut finish improves the look of the bench and helps it blend in with your other furniture. The Linon Home Décor Cynthia Storage Bench has a flip top lid just beneath the seat which makes sitting on the bench comfortable. 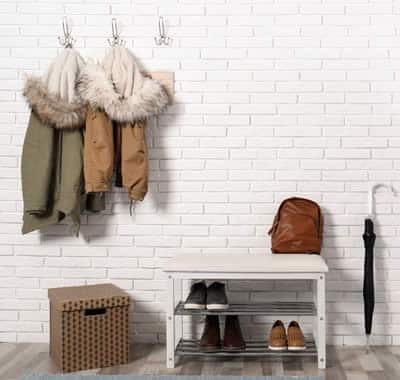 It is one thing to make your entryway look good, but to eliminate clutter in the process, that is truly a great thing. Although there’s a lot to love in the Linon entryway storage bench, we’re quite fond of the stylish design. In terms of aesthetics, nothing can rival the Linon storage bench. We definitely recommend this if you have the space for it. When it comes to making good first impressions, the Simpli Home Warm Shaker Entryway Storage Bench simply knocks it out of the park. 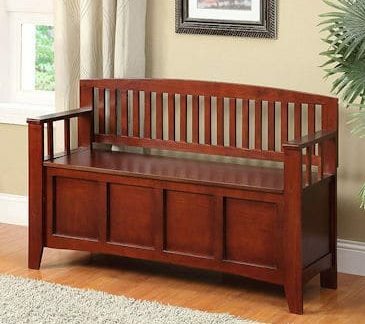 This fantastic bench will refresh the look of your entryway and make it look impressive. It should also look great in most houses. Its color is easy on the eyes and will instill a feeling of comfort in your guests. Speaking of comfort, the Simpli Home Warm Shaker Entryway Storage Bench is designed with comfort and functionality in mind. It has brushed nickel knobs and square tapered legs. It’s also rather comfortable to sit on, and it can fit 2 people with ease. When it comes to storage, the Simpli Home Warm Shaker Solid Wood Entryway Storage Bench comes with three enclosed storage compartments for you to store your shoes, clothing, and unnecessary clutter in. As we mentioned earlier, the Simpli storage bench will look good in almost any entryway thanks to its rustic style and light-colored wood which is relaxing to look at. This is yet another fantastic bench that we wholeheartedly recommend. This elegant entryway bench is made specifically for you to store your shoes, slippers, and other footwear in. It’s made from solid wood which gives it its own unique charm. With that said, it won’t come assembled, so just like the aforementioned Winsome Wood Milan wood storage bench, you’ll need to do some assembly on your own before you can fully see it in its full glory. Once you’re done with the assembly part, you’ll rejoice as the hassle will have been totally worth it. You will be able to comfortably sit on it and also make use of its large storage capacity which should be able to accommodate a large family’s footwear. Even though the Winsome storage bench was mainly designed for storing shoes, the top can be used to add more decorations such as flower vases further, or you can just use it for mail storage or holding keys. It’s that very versatility that we dig in this bench. Having an entryway bench in your hallway will surely embellish your house and give a better first impression on your guests. However, it’s not only for making the home more welcoming for your guests, but it’s also going make you feel more welcome in your own house, by making it look better and livelier. Storage benches are also useful for eliminating unnecessary clutter or storing shoes and other footwear. They really help you keep your house tidy and organized. Some storage benches even allow you to store other clothing wear which is neat. Here is a list of the numerous advantages of having an entryway bench in your house. You can sit on them while you put on or remove your shoes. You can also sit on them when you’re waiting for a cab or a ride in general. They are perfect for storing all kinds of stuff in them that would otherwise ruin the look of the house. Most kids and even adults tend to throw away their bags and other things just as soon as they enter which is a bad habit. However, an entryway storage bench allows you to store them and instills better habits in you and your family. If you want to test your DIY skills, this video is an excellent tutorial for you to follow to make your own storage bench. Just follow the steps and before you know it, you will have an entryway bench exactly as you want it! The hallway is one of the house parts that one doesn’t really give much attention to, which can affect the overall organization of your home. Having one of the best entryway storage benches is essential for several reasons, which we detailed above. Any of our recommendations can be the best entryway storage bench for you depending on many factors, including your budget, décor, house size, preferences, etc. To make a sound decision, make sure to determine everything beforehand and to compare the products thoroughly using our reviews. If you liked our guide, don’t hesitate to share it, as many people may benefit from it!